Video clip synopsis – It's often said that the camera doesn't lie but the photograph can be manipulated like any other art form. Broadband MP4 hidden10_bb.mp4 (17.4MB), suitable for iPods and computer downloads. J.W. Lindt — The Mechanical Eye of the Camera is an episode of the series Hidden Treasures (15 × 5 mins) produced in 2006.
students should be able to discuss the ways in which social values shape the content of media texts and analyse how social values are reflected in a text. Students should be able to discuss theories of media influence and analyse debates about the nature and extent of media influence. It’s often said that the camera doesn’t lie; but because the mechanical eye of the camera is being directed by a human sensibility, the photograph can be manipulated like any other art form. The way an image is cropped, captioned or even the way it is presented can influence the way we read it. The invention of photography meant that, by the mid 19th century, many more families could own images of themselves. Photo albums were all the rage, and photographers often looked for picturesque or exotic themes for the pictures they took. Helen Lambert posed her subjects in a costumed tableau and her album’s handpainted decorations present the images as an eastern fantasy. Photographs also found their way into newspapers and magazines. Although printing processes of the time could not reproduce photos directly, engravings based on photographs were printed in their pages. In the minds of the readers, this seemed to carry a greater veracity than drawings from life. An engraving based on a photograph taken by official photographer Mr Burman of dead bushranger Joe Byrne appeared in The Bulletin on 10 July 1880. J. W. Lindt’s photograph of the same scene is particularly remarkable because, rather than concentrating on the body, which has been strung up for that very purpose, Lindt has taken a wider shot of the whole scene, including a cameraman and the artist Julian Ashton who were there to record the event. His image marks the new age of photographic reporting. 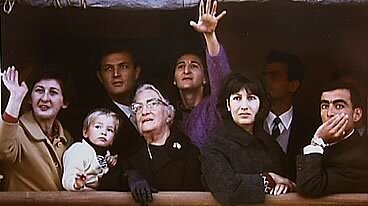 A more recent example of artistic manipulation of an image is David Moore’s 1966 colour photograph showing a middle-class Egyptian family who had joined a ship in Melbourne to accompany a relative returning to Sydney after a holiday abroad. When Moore exhibited the photo in the mid 1970s, however, he printed it in black and white and titled it Migrants Arriving in Sydney. It has since become an icon of the 1950s European migrations. What is happening in each photograph? What does the image convey to you? Do these images provoke an emotional response? Explain. Where and when do you think each picture was taken? Are any images in the photographs used as visual symbols, and do you think the imagery has been manipulated by the photographer? Do you think newspaper images taken out of context could be misleading? Why do you think visual images make such lasting impressions on our emotional memories? Do you think you can count on photographic evidence to ‘tell a story’? Write an essay looking at photography as a form of fine art and as a way of documenting history. Can photography achieve both ends at the same time, or should photographic evidence be regarded as more important than artistic expression? Create a dual photographic timeline with captions, using both famous newspaper images that have left a lasting impression and personal photographs documenting your own life experiences and memories.